Not content with keeping busy on CAPSULE, Kyary Pamyu Pamyu and Perfume, producer Nakata Yasutaka has now been working alongside SCANDAL for their new single. ‘OVER DRIVE’ will be SCANDAL’s 17th single (following on from ‘Kagen no Tsuki’ which was released earlier this month) and Nakata Yasutaka is handling production duties for the title song. The single also features the track ‘SCANDAL IN THE HOUSE’, produced by Kosaka Daimaou, which features all members on the main vocals. 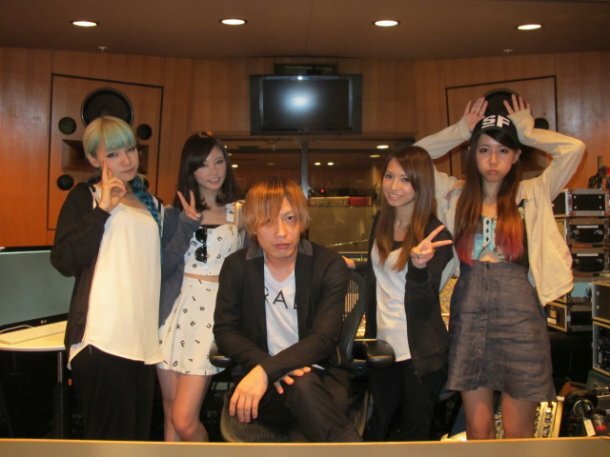 SCANDAL have also announced the release of their new album Standard for October. The album comes in 3 different flavours: Complete Production Edition, Limited Edition, and Regular Edition. The Complete Production Edition comes with a T-Shirt, while the Limited Edition will come with a DVD including the PVs for ‘Awanai Tsumori no, Genki de ne’, ‘Kagen no Tsuki’ and ‘SCANDAL IN THE HOUSE’. ‘OVER DRIVE’ is released on 18th September while Standard is due for release on 2nd October.